You have to feel sorry for all those people who invest their hard-earned cash in a ski or snowboard holiday. Then get treated like cattle. Long waits at airports. Hidden extra costs. Delays due to seasonal weather. Long coach transfers. You have to feel sorry, because there is an easier way. Europe has a good train network which can get you to many resorts in little more time than it would take you by plane or road. 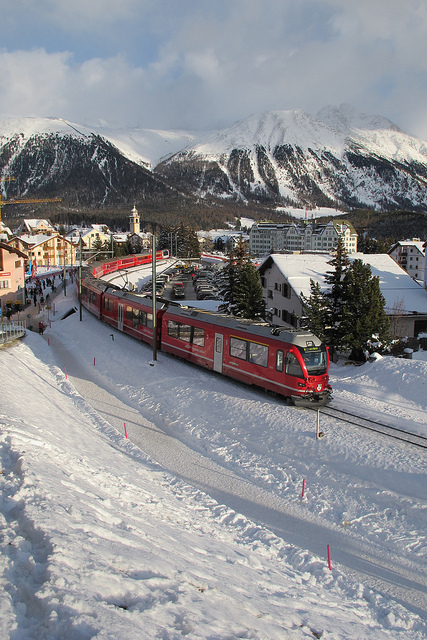 In addition the trains usually run on time throughout winter, especially so in Switzerland, and they are comfortable. Even transferring between trains is remarkably hassle-free. And you don't get charged for bringing your gear. Or get frisked for going by rail. This web site is dedicated to those who choose the ecologically best transport option for skiing and snowboarding. The train. Your carbon footprint is roughly 15% of what it would be if you flew or drove. With winter sports in many areas at risk from climate change, that should give pause for thought. Even those of you who may choose to fly to the Alps may want to consider using the train for onward travel rather than have a long coach transit. Both Geneva airport and Zurich airport have train stations inside the airport, with good onward connections. It is also only a short hop on the regular and reliable bus route F to get from Innsbruck Airport to the main railway station, on bus line 2 from Salzburg Airport to the main station and on bus route 50 to get from Euroairport to Basel's main station. You should normally be at the station within half an hour, as in each case the buses usually run every ten minutes or so and take around a quarter of an hour. We have only listed resorts in our directory below where there is a railway station in the resort or where you only need take a cableway to get to the resort from a railway station. There are no bus transfers for the last leg - although you may need to take a courtesy ski bus within the resort to get around. We also consider these resorts worth the effort of getting to for a day, a weekend or for a longer break, depending on where you start from. We hope you decide to choose the snow and rail option.